What counts for fun around these parts? Yesterday someone posted a comment on my Anglo Info blog asking about ballroom dancing and social lives in these here parts. I’m afraid I will have burst her bubble over what happens in rural areas. Rural areas are the same the world over I think, be it Brazil or Australia, Thailand or France. My answer was this: if you need a social life, you might be better to move to the city. Or near a city. Or near a big town. But Latin American dancing out here in the sticks? We do have thé dansant events from time to time (by which I mean once or twice a year). I have no idea what thé dansant involves except to say I imagine it like a village hall full of old people copping a feel during a waltz. Tango and Salsa it is probably not. Though I could be being judgemental. Line dancing is very popular in some parts. Zumba has definitely arrived. Step aerobics are still massively popular. I last did step aerobics in 1994, so we’re only about 20 years behind the latest fad, I guess. That is not to say that villages are without life. My village has an organised walk once a month. There are PLENTY of committees a person can get involved with, especially if you speak French. And if you don’t speak French you can move to a village like the next one up from me where the phone book is filled with English names and there are at least three rival committees of purely English-speaking gens. I would say mostly such English enclaves are fairly thick on the ground in these parts and it is easy to find one if you ask an estate agent. I do not live in an English enclave. There are four or five English folk in the village but mostly they are either of an age or they are married to French people and they work or have families. So when I have finished work, I am usually an anti-social soul. I have too many dog walks to do and too many crafty things I want to do. That is not to say I don’t have social outings or hang around with other people. This week is atypical, but has been remarkably social. This is good. It is still raining. My garden activities are limited to looking at it from a window. Yesterday I took advantage of the bank holiday to go to a fabric sale in Brillac. Brillac is a lovely little village – it’s how people imagine France. I suspect therefore that it has a large continent of ex-pat owners, though I could be wrong. Anyway, the lady is parting with a collection of fabric that she had picked up over the years, as well as a good few boxes of vintage buttons and patterns. I apologise in advance because I’m going to make it seem kitschy just because of what I bought. In fact, she had vintage fabrics from the 1930s and beautiful, beautiful buttons. Is there a girl alive who doesn’t love a button box? I still remember my mum’s button box and many of the buttons in it. I loved the big chunky rounded ones most. And, as far as I am aware, I didn’t swallow any. The lady saw my obvious raptures (I was not alone: Sylvie and Nic also got all giddy and at one point I looked at Sylvie and I’m convinced her eyes had turned to buttons, she was that enthralled) and we talked a bit about my sewing heritage. Sewing is in my genes from both sides of the family. My grandmother was a machinist in the big textile lines in Manchester. I still remember poking inside-out belts through with a knitting needle at her house for gaberdine belts. She made suits for many of the big names in the fashion world and I still have many coats she made, including my favourite Red Riding Hood coat that I have worn every winter since she made it. It is a beautiful coat. My Nana made clothes with sharp lines and good cloth. She knitted and she made other things too, but I never remember her embroidering or doing any sewing for pleasure. On the other side – well, is there any sewing my mum can’t do? From frilly dresses to ra-ra skirts, dresses I wore on holiday, curtains, blinds, cushions, embroidery, detail. My mum loves it all and is immensely talented at it. I’ve not seen her knit for years, but she is also very good at that too. Anyway, I digress. After I had given the lady my fabric-loving credentials, I set about finding treasures. I found two patterns I just had to buy. From John Lewis don’t you know? Anyway, I’m not interested in the pattern on the left. No. I am interested in the ra-ra skirt. 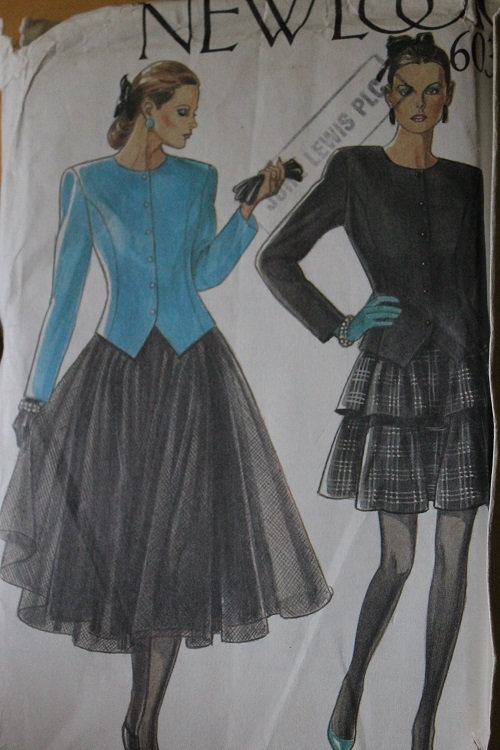 I have decided I am going to relive my eight-year-old life and make a ra-ra skirt just for kicks. My mum made me a pink-and-white polka dot ra-ra skirt which I loved very much as an eight year old, so I am going to make one again. They are in fashion so that is okay. I might even make a Strawberry Switchblade one. But this was not my only find. I found a knitting pattern. And I couldn’t not have it. 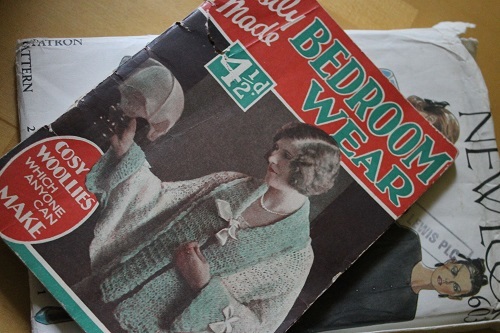 Because who doesn’t need a range of knitting patterns for bedroom wear??! You can even, should you so wish, make knitted underwear. And not just underwear but ‘shapely’ underwear. Shapely! 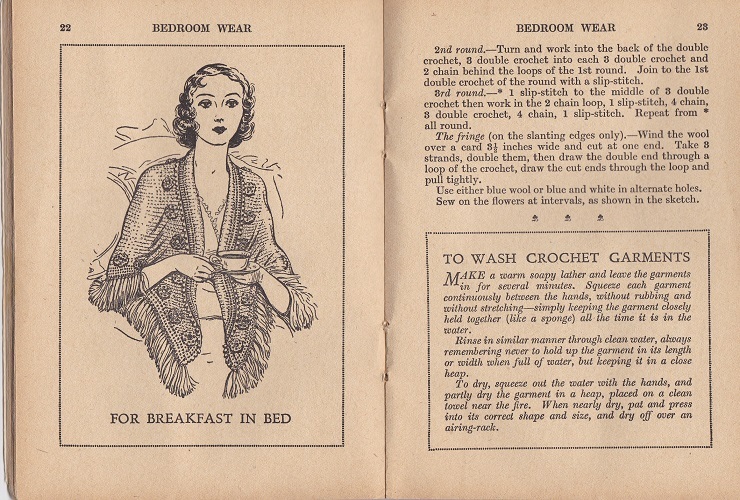 I love that this book is filled with advice on style as well… there is a triangular shawl and the book advises ‘for breakfast in bed’. Unfortunately, the wool mentioned is long since gone and I’ll have to find an approximation. I won’t be touching the crochet ones either as I am not good at crochet. However, I may very well knit someone a bra and bloomers for Christmas. I think it would be rude not to. So as for what people do for fun around these parts, speaking only for myself, rummaging through 70s and 80s patterns, button boxes and vintage fabrics is an afternoon well spent! And that does sound like fun! Must have been a blast chatting with her and looking through her stash. Looking forward to hearing how you make out with the knitted bra and undies. Hopefully they will be shapely ones. I hope so too! I’ll be cross if they are unshapely now it’s specifically made it clear they are shapely! Your post reminded me that as children my sister and I wore undershirts knitted in wool by one of my mother’s aunts. Not only were they very prickly, but, pinned on these shirts, were little cloth bags that held a piece of camphor! It was supposed to keep colds away. We must have smelled quite strongly of camphor. I’m still laughing at the camphor. That is the best use of a vest I have ever heard. I wonder what the youth of today will find to shake their head in wonderment over. 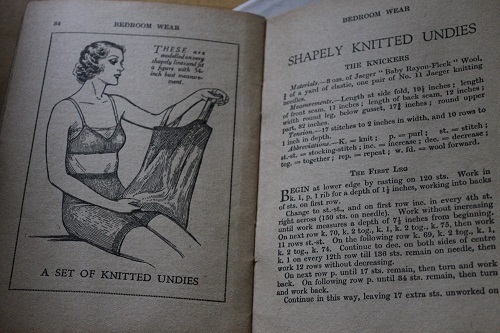 ‘Shapely Knitted Undies’ – if I needed a prod to get on with my new knitting machine, that might be it! Love those old patterns, you must have such fun going through them. You could have a business selling ‘Shapely Knitted Undies’ if you put your mind to it! Oh Lady Justine… I had to pinch myself to make sure it wasn’t me writing this post! My maternal grandmother was a seamstress and owned a haberdashery shop. My mother made all our clothes and was an avid knitter. I owned a pair of shorts made out of wartime canvas and a tent (or, rather, teepee) made of parachute nylon. I, too, had knitted undies; well a knitted vest at least, right up to my grammar school years. Oh the shame of getting changed for gym and the futility of trying to explain to my mother that wool made me itch beyond anything I’d ever experienced! And all those patterns.. and the button boxes… oh, and the knitting patterns,too. I’m drooling at the thought! How I would have loved to have been there! Lucky lucky you! Enjoy your purchases; I can only covet them! You would truly have loved it Elizabeth – it was really nostalgic! If you like I could knit you a vest so you can remember the sensation! ps. How I’d love to see your finds. Can I be your first groupie?! I would have been in heaven myself amongst all those old patterns. And that bed jacket could be very useful !! That bed jacket will be just perfect! Unfortunately, it was a crochet version, so I will have to learn how to do that! I love that pattern on the left, so elegant !! And I can just see you sitting up in bed in one of the bedroom wear shawls, being such a lady of leisure ! Still it may come in useful for wrapping up in on those chilly nights. As for button boxes, they are still irresistable. How gorgeous!! My granny still has some 1930s patterns that I covet – she’s always sewn and until she was about 95 (couple of years ago), she still made all kinds of alterations (a dress out of a 2-piece or a 2-piece out of a dress or altering a neckline…) on her hand-cranked sewing machine!! I think my mom was adult before she had any shop-bought clothes. The nice thing is my youngest daughter (18) is training to be a seamstress 🙂 I find that really exciting. Her great-grandma on her dad’s side was also a seamstress, so it feels as if she were following on in a long line of tradition, which I love. As for knitting, I picked that up from a great aunt when I was little. Not so long ago I couldn’t resist trying out one of those vintage patterns and made a ribbed vest and pants, figuring that my middle daughter would probably wear them as outwear… ;o!! Definitely warm! I used standard wool sock yarn that is still sold here in the supermarket to get gauge – and it’s quite soft, too. As for social activities, I might sound a bit snobbish but although there is probably at least one token Englishwoman married to a Swiss in every village around here, I have always avoided expat activities – if I wanted to be with Brits all the time, I’d have gone to live there or in Zurich where you don’t need to bother with the local lingo… Now, after 30 years in the German-speaking area of Switzerland, I feel a lot more Swiss than English, even if I am still considered a bit whacky and foreign! I think that is just lovely that you have a continuation of the family traditions. It’s obviously something that runs in the blood. It’s amazing how many memories the patterns bring back. And yes, we were much more thrifty in my home as a family when I was small. All hand-me-downs and alterations and hand-mades, though we did have shop stuff too. Funnily, though I never thought it would, it’s the handmade stuff that has the most sentimental values for me.